politics of revenge, resistance and retribution,” even as he demanded they approve a border wall they have long opposed. The president did not say what he might do if Congress denied him wall funding. He also made no mention of his threat to declare a national emergency, which would allow him to build a wall using his own powers but could divide Republicans and prompt legal challenges. The House chamber was full of reminders of the divided Congress. Pelosi, dressed in white along with other women of the House and Senate to honor the suffragette movement, was seated behind Trump, with Vice President Pence beside her. approval rating, according to a CNN poll released this week. In the audience, Trump could see a number of politicians who hope to defeat him in the 2020 election, including Sens. Elizabeth Warren (D-Mass. ), Kamala Harris (D-Calif.), Cory Booker (D-N.J.). and Kirsten Gillibrand (D-N.Y.), who rolled her eyes at one point during his remarks and later fund-raised off the moment, which was caught on television. The House also includes more women and minorities than the audience for last year’s State of the Union, courtesy of the Democrats’ success in the midterm elections, and one of the most remarkable moments came when a group of female Democrats stood and applauded when Trump congratulated them while claiming credit for job gains among women. “You weren’t supposed to do that,” a bemused Trump exclaimed. said “that’s great” when the cheers finally wound down. 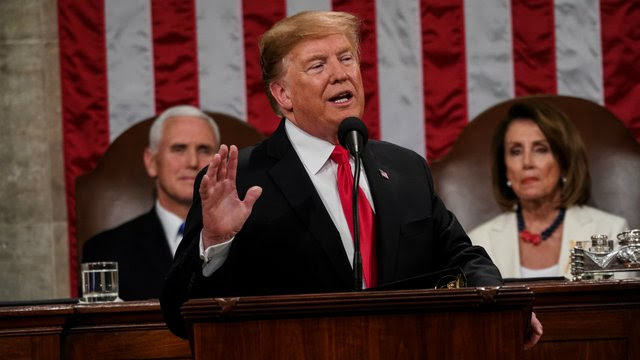 He also urged Congress to approve his administration’s revision of the North American Free Trade Agreement with Canada and Mexico, which could come up for debate later this year. attempting to wind down the war in Afghanistan. Previous story L.V. massacre: Many Questions. No answers. Some things we might not ever know.